And, as much as I’m loathe to say goodbye to beautiful summer days, I’m also ready to get back to reality and to get back to healthier routines. No more lazy summer days full of chips and popsicles as snacks; no more enormous servings of restaurant meals eaten out while traveling. Back to simple and healthy! If I’m honest, I have to admit that I function best on a schedule. 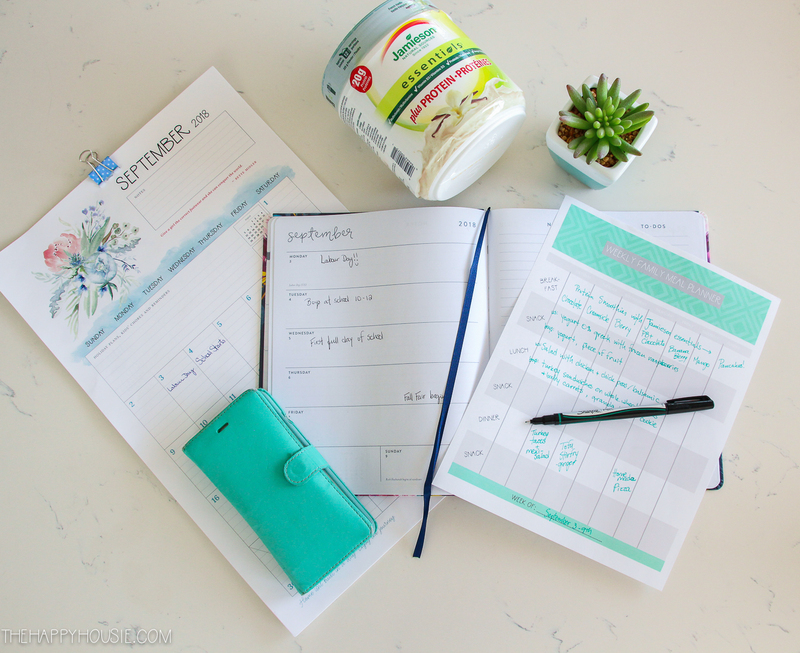 I’m much more productive when I have routines in place in all areas of my life; and ironically, I find it much easier to stick to a healthy eating plan when our lives our busy and scheduled. As long as we PLAN, that is. It’s true! I’m a planning nerd. But it’s SO worth it for our family’s health and sanity (or, at least, for my sanity!). 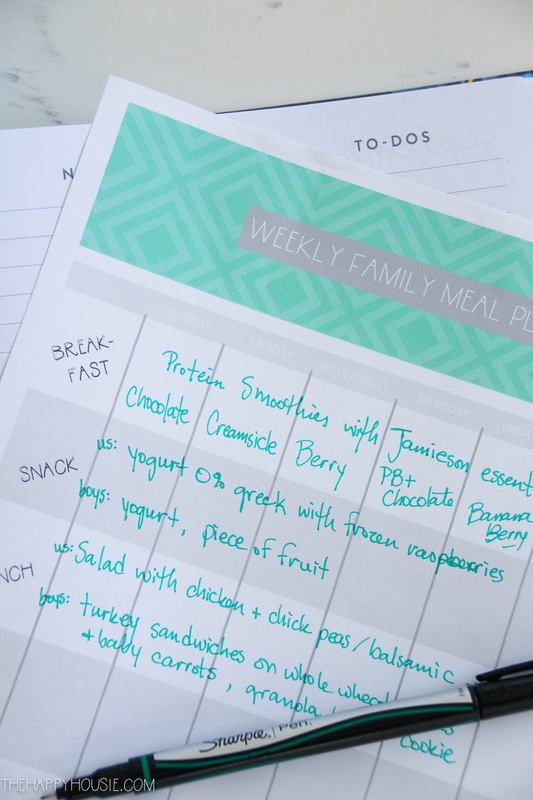 Planning ahead is KEY to making sure our family has healthy meals during the busy school year, and I like to keep things pretty simple on the week days. I find it takes a huge amount of pressure off my week if I take time to sit down on Sunday afternoons and plan out our family’s meals for the entire week. Having go-to breakfasts and lunches for our family keeps things really easy, and thankfully none of us seem to mind eating the same kinds of foods repeatedly for our school or work day lunches. And, we all LOVE to start our morning off right with a quick and delicious protein smoothie. 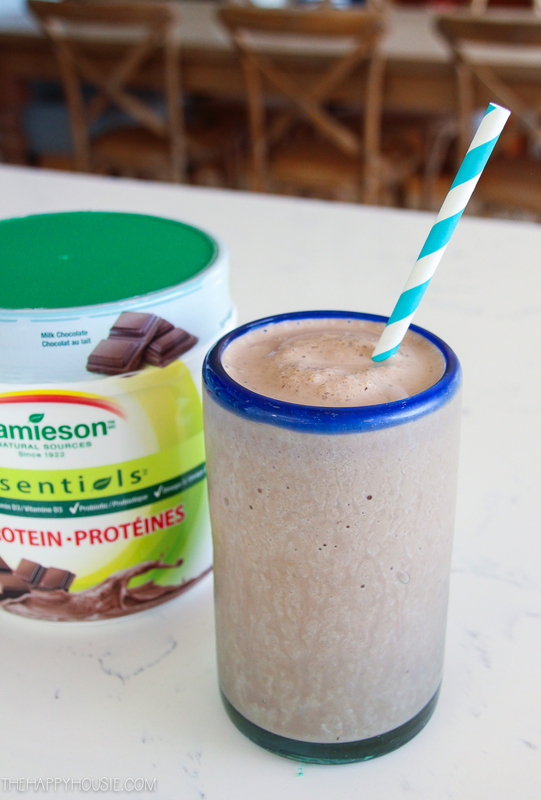 I recently discovered Jamieson Essentials™ plus Protein for our smoothies and we are over-the-moon about it. Not only is it super delicious, but it’s packed with vitamins and nutrients including all four Jamieson Essentials™– 100% Multivitamin, 600 IU Vitamin D3, 1 billion CFUs Probiotic and 350mg Omega-3 from Flax, plus 20g of protein per serving. Available in three delicious flavours (french vanilla, milk chocolate, and berries & cream), the variety of smoothie flavours you can whip up are nearly endless. Our favourite so far is the chocolate peanut butter bomb. My youngest named it…. We just mix together the Jamieson Essentials plus Protein™ milk chocolate along with some PB2 (powdered peanut butter), and either a frozen banana and/or a cup full of ice. It tastes like dessert for breakfast! So, there we go! That’s how I’m planning to start this school year off right, with healthy mornings and solid weekly planning. Will you join me? 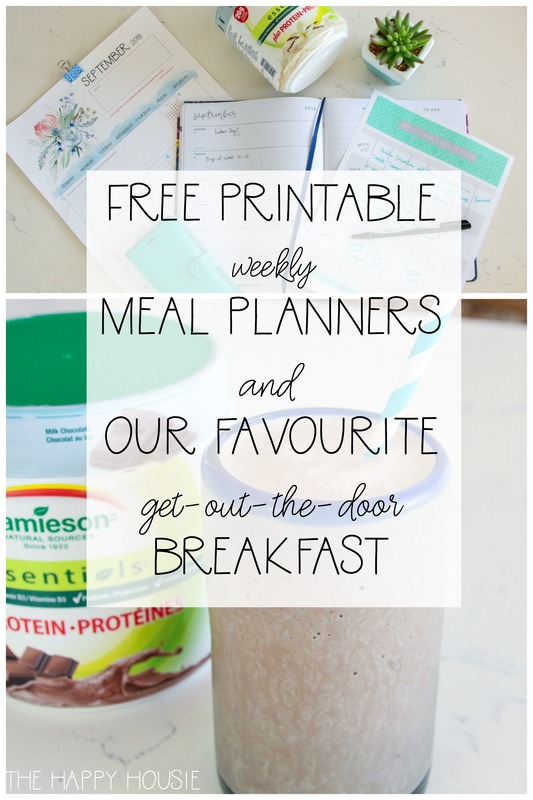 Want to download your own copy of the weekly meal planner, plus have access to my entire free printable library? Just sign up for my email list below!